Traditional markets are a meeting place for sellers and buyers and are characterized by direct buyer sellers' deals and there is usually a bargaining process, usually consisting of kiosks or outlets, stalls and open bases opened by both the seller and a market manager. Most sell daily necessities such as food ingredients such as fish, fruit, vegetables, eggs, meat, cloth, clothing electronic goods, services and others. In addition, some are selling pastries and other items. Such a market is still widely found in Indonesia, and is generally located near residential areas to facilitate buyers to reach the market. Some of the "legendary" traditional markets include Beringharjo market in Yogyakarta, Klewer market in Solo, Johar market in Semarang. 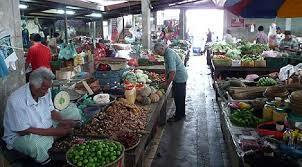 Traditional markets throughout Indonesia continue to try to withstand the attacks of the modern market.